It looks like they are right on schedule. In 2018 and 2017, they released footage of their staged "sarin gas attacks" in early April. The newest report on US-led operations against Islamic State in Iraq and Syria admits the terrorist group is down to some 2,000 fighters, but argues continued US presence in the region is needed to prevent its resurgence. Published on Monday, the report authored by the Pentagon and State Department inspectors-general also blamed Turkey for spoiling the US-backed Kurdish militia’s operations against Islamic State (IS, formerly ISIS/ISIL), and predicts no end to strife in the region, going against President Donald Trump’s order to withdraw US troops from Syria. The coalition gave conflicting assessments of IS strength and capabilities, reporting at the end of December that it “remains a battle-hardened and well-disciplined force,” with high morale and “unfazed by Coalition airstrikes,” only to say its morale was “trending downward” in January. Since December, IS has killed several coalition soldiers in ambushes and with roadside bombs. According to CENTCOM, these are “opportunistic attacks” that will allow the militants to claim a propaganda victory. 'US Middle East policy is becoming increasingly confusing, as Donald Trump assured his coalition allies that “100 percent” of Islamic State will be defeated “next week.” However, the military has warned it remains a real danger. Representatives of a 79-member, US-led coalition fighting Islamic State (IS, formerly ISIS) gathered in Washington on Wednesday, eager to hear Donald Trump’s vision of combating terrorism in the Middle East. The president lavished praise on US troops, but coalition members heard almost nothing that was new. Further into his speech, Trump claimed that “our coalition partners and the Syrian Democratic Forces have liberated virtually all of the territory previously held by ISIS in Syria and Iraq.” What he forgot to explain, however, is that the predominantly Kurdish SDF is controlling parts of northern Syria – but not the rest of the country. The major cities of Aleppo, Palmyra, Homs and others were in fact liberated by Syrian government forces. That aside, there were numerous damning reports that the SDF actually met no resistance when entering IS-controlled areas. Other reports suggested US Special Forces and hardware were spotted at Islamic State positions. Trump claimed that “it should be formally announced sometime probably next week that we will have 100 percent of the caliphate.” His subordinates, however, were more cautious when talking about the situation on the ground. “The fight against ISIS and violent extremists is not over, and our mission has not changed,” General Joseph Votel, head of the US Central Command, said this week. He warned that the terrorist group still commands approximately 1,000 to 1,500 fighters in Syria alone, adding that he is “not under pressure” to withdraw the 2,000 troops that are stationed on Syrian soil without the consent of the Damascus government. ISIS is a US creation. So are al-Qaeda, its al-Nusra offshoot, and other terrorist groups - used by the Pentagon and CIA as proxy troops. The US and its imperial partners support the scourge of ISIS and likeminded terrorist groups they pretend to oppose. Syria and Hezbollah forces, greatly aided by Russian airpower alone, are “knocking the hell out of ISIS,” its ranks greatly diminished but not defeated. Turkey’s Erdogan pretends to oppose the scourge he actively supports, giving ISIS and other terrorists safe haven in the country’s territory, letting them move freely back and forth cross border. On Wednesday, sources quoted by Sputnik News’ Arabic-language website said around 1,500 terrorists entered Syria’s Idlib province from Turkey in the last 48 hours - a flagrant Sochi agreement violation. Erdogan is a tinpot despot, never to be trusted, an obstacle to conflict resolution in Syria, an enemy of Bashar al-Assad, wanting him toppled, wanting Syrian territory bordering Turkey annexed, mainly its oil-rich areas. He lied to Vladimir Putin, breaching the Russian/Turkish northern Idlib province demilitarized zone agreement. It remains a hotbed of US/NATO/Saudi/Israeli/Turkish supported terrorists. Nearly five months after Erdogan promised to disarm them, they’re more heavily armed and entrenched than earlier - using their positions to attack government forces and civilians. Like Obama, his regime is doing precisely the opposite, including in Iraq, Afghanistan, Libya, and likely elsewhere, deploying ISIS and other jihadists to these countries - arming, funding, training and directing them. Congress, the Pentagon and CIA want US forces remaining in Syria. On Monday, Senate members overwhelming voted against withdrawal of US troops from Syria and Afghanistan - falsely claiming ISIS and al-Qaeda pose a serious threat to the United States. According to the Damascus-based Syrian Human Rights Network head Ahmad Kazem, al-Nusra terrorists, aided by White Helmets, moved barrels of toxic chlorine to Idlib’s Khan Sheikhoun “in two ambulances,” the location of a 2017 CW false flag, wrongfully blamed on government forces. He added that the barrels were stored in a refrigerator truck to preserve them for use against civilians when ordered. In late January, Russian Foreign Ministry spokeswoman Maria Zakharova warned that Western-supported White Helmets were preparing to film staged CW attacks in Idlib. Time and again, government forces are wrongfully blamed for incidents they had nothing to do with. US, UK and French warplanes earlier attacked Syrian sites after false flag CW incidents. It’s just a matter of time before the next staged CW false flag, a pretext for Pentagon-led warplanes to attack Syrian military sites, perhaps Damascus on the US target list as well. VISIT MY NEW WEB SITE: <a href="http://stephenlendman.org/" target="_blank" rel="noopener noreferrer">stephenlendman.org[/url] (<a href="http://stephenlendman.org/" target="_blank" rel="noopener noreferrer">Home - Stephen Lendman[/url]). Contact at <a href="/cdn-cgi/l/email-protection#2c40494248414d425f58495c4449426c5f4e4f4b40434e4d4002424958" target="_blank" rel="noopener noreferrer"><span class="__cf_email__" data-cfemail="99f5fcf7fdf4f8f7eaedfce9f1fcf 7d9eafbfafef5f6fbf8f5b7f7fced ">[email protected]</span>[/url]. Re: Trump on Syria ? 'At least 70 civilians were killed or injured over two days as Kurdish militias advance on an ISIS-held town in eastern Syria. The US-led coalition supports the operation with deadly airstrikes. The offensive was launched on Monday and is touted as an attempt to capture the last remaining territory held by Islamic State (IS, formerly ISIS) terrorist group on Syria’s border with Iraq. Al-Baghuz Fawqani is a small town on the Euphrates River that had a population of some 10,000 before the war in the country started in 2011. The forces of the Kurd-dominated SDF are being supported by the US-led coalition, which provides air support to the militias on the ground. According to SANA, the Syrian government news agency, at least 70 civilians were killed or injured on the outskirts of the town by the airstrikes. One of the targets for the warplanes was a local mosque, which, the coalition says, has been repurposed by the terrorists as a command and control facility, from which car-bomb attacks against the Kurdish forces were directed. In a statement UK Maj. Gen. Christopher Ghika said this made the mosque a legitimate target not protected by international law. Riam Dalati, a BBC Syria producer, has said that the footage of people being treated after an alleged chemical weapons attack in the Syrian city of Douma was staged. Dalati wrote on Twitter on Wednesday that the issue had been investigated for six months. The journalist pointed out that no fatalities had occurred at the hospital, adding that the attack in Douma had happened but sarin had not been used there. However, Dalati noted that the Organisation for the Prohibition of Chemical Weapons (OPCW) would look into whether chlorine was used at the scene. Truth is @James__Harkin got the basics right in terms of #Douma's "propaganda" value. The ATTACK DID HAPPEN, Sarin wasn't used, but we'll have to wait for @OPCW to prove Chlorine or otherwise. However, everything else around the attack was manufactured for maximum effect. — Riam Dalati (@Dalatrm) 13 февраля 2019 г. Everything else around the attack was fabricated, according to Dalati. The Russian Foreign Ministry, commenting on the issue, said that Moscow is awaiting the BBC's official position after a statement by one of its producers about footage after an alleged chemical attack in Douma. "The culmination of this theatre of the absurd may be considered the statements by a producer from Britain's BBC, who confirmed, based on his own research, the staged nature of the footage with the direct participation of the ‘white helmets'", Maria Zakharova said. She added that Moscow wants to hear the company's position as a whole, because it actively covered those events. 'The militia groups relying on US support in Syria will be sold out by Washington, which sees them as a token chip in a political bargain, President Bashar Assad said, while apparently referencing the Syrian-Turkish border. Relying on foreign support will only see those groups becoming the “slaves of Turkey,” he warned. “Nobody will protect you except your state,” Assad said. He added that Damascus treats “any intruder” as an enemy and is adamant “every inch of Syria will be liberated.” While Assad did not specifically name those “betting on the Americans,” the message has apparently targeted the so-called Syrian Democratic Forces (SDF) – the US-backed, Kurdish-led militia, which is controlling the northeastern parts of the country. Syrian troops and the SDF have avoided engaging in a direct conflict over the years, yet relations between them appear to be quite strained. The fate of the SDF remains uncertain as the US announced withdrawal of its troops, occupying parts of Syria, late last year. Washington has promised to somehow simultaneously “protect” the Kurdish-led militias, and address “concerns” of its allies at the same time – Turkey's concerns, primarily. 'The US-led coalition purportedly fighting the Daesh Takfiri terrorist group has airlifted to safe sanctuaries several large boxes full of “spoils” that members of the foreign-sponsored terror outfit had claimed in Syria’s eastern provinces of Hasakah and Dayr al-Zawr as well as neighboring Iraq. Local sources, requesting anonymity, told Syria’s official news agency SANA that US-led military helicopters landed in the Dashisha area of Hasakah as well as Hajin town in Dayr al-Zawr, and transported dozens of Takfiri commanders and militants to unknown locations following a deal. The sources added that the extremists, in return, directed the US-led forces to their caches of stolen gold east of Shaddadi town. The report corresponds with earlier reports that Daesh terrorists had transported some 40 tons of gold bullions stolen from the strategic northern Iraqi city of Mosul, located some 400 kilometers (250 miles) north of the capital Baghdad, and other areas in Syria to Dashisha. SANA, citing information received from local residents, reported on October 7 last year that American helicopters had evacuated Daesh commanders from Shaafah town in Abu Kamal district of Dayr al-Zawr to an undisclosed location. The US-led coalition has been conducting airstrikes and operations against what are said to be Daesh targets inside Syria since September 2014 without any authorization from the Damascus government or a United Nations mandate. On February 12, the Syrian Ministry of Foreign Affairs and Expatriates, in two separate letters addressed to UN Secretary General Antonio Guterres and the rotating president of the Security Council, Anatolio Ndong Mba, denounced the coalition strikes conducted against Baghouz town a day earlier, saying the US-led warplanes had pounded a refugee camp. 'LONDON — Over the past few days, notable journalists and other figures in mainstream media have acknowledged that the alleged chemical weapons attack that occurred last April in the Damascus suburb of Douma, Syria was likely “staged” by “activist” groups such as the White Helmets. Their comments and investigations have largely vindicated the many journalists and academics who cast aspersions on the precipitous Western media campaign to blame that alleged attack on the Syrian government. Many of the dissenting voices were derided as “conspiracy theorists” or ignored entirely by mainstream sources. Yet, now that these revelations are being voiced by acceptable figures in mainstream media, those who have built their careers on promoting the White Helmets and regime change in Syria are working to discredit these new dissenting voices. Among those on the counter-attack are individuals connected to the oligarch-funded “humanitarian” regime-change network that was the subject of a recent MintPress exposé. The alleged Douma attack — notably used as the justification for a military attack launched against Syria by the U.S., the U.K. and France — returned to the news cycle earlier this month following a report from James Harkin, a journalist who has written for The Guardian, Harper’s and the Financial Times, and is currently the director of the Center for Investigative Journalism. Harkin’s report, which was published in The Intercept, cast doubt on the prevailing mainstream narrative surrounding the events that occurred in Douma last April. In violation of international law, as stated in the The United Nations Charter and Universal Declaration of Human Rights . 'Jihadi bride, Shamima Begum,has had her British citizenship revoked by the Home Office. The 19-year-old, who had expressed the desire to return to the UK with her newborn son, will now be banned from entering the country. It is understood the teenager, who grew up in Bethnal Green east London, has dual Bangladeshi nationality, meaning the move will not render her stateless. In a letter sent to her family in east London, officials said the Home Secretary, Sajid Javid, had made the decision in "light of the circumstances". The letter read: "Please find enclosed papers that relate to a decision taken by the Home Secretary, to deprive your daughter, Shamima Begum, of her British citizenship. "In light of the circumstances of your daughter, the notice of the Home Secretary's decision has been served of file today (19th February), and the order removing her British citizenship has subsequently been made." The letter went on to urge Ms Begum's family to make the teenager aware of the decision, but added that she had a right to appeal. In a statement the family's lawyer said they were very disappointed by the move. Tasnime Akunjee said: "[The] Family are very disappointed with the Home Office's intention to have an order made depriving Shamima of her citizenship. We are considering all legal avenues to challenge this decision." 'The US-led coalition purportedly fighting the Daesh Takfiri terrorist group has reportedly withdrawn dozen of the extremists and their family members from their shrinking enclave in Syria’s eastern province of Dayr al-Zawr and near the Iraqi border. The so-called Syrian Observatory for Human Rights (SOHR) reported that more than 50 trucks belonging to the military alliance and covered tightly with tarps carried the terrorists along with their family members out of Baghouz village east of the Euphrates River on Wednesday. Informed sources, requesting not to be named, told the Britain-based monitoring group that US-led military helicopters were hovering in the skies over the area as the exit took place. The Observatory had earlier reported that negotiations were underway between the US-backed and Kurdish-led Syrian Democratic Forces (SDF) and Daesh remnants, with the latter demanding a safe passage to an unknown area believed to in the desert areas of Iraq’s western province of al-Anbar. The observatory has learnt that no agreement has been reached up until now. It announced on Saturday that SDF forces had captured Daesh’s last remaining enclave in eastern Syria. The monitoring group stated the last few hundred terrorists, many of them foreigners, had surrendered in the past two days to the US-backed forces. It said some militants may still be hiding in underground tunnels. 'The White House has announced that around 200 American troops will remain in Syria on a “peacekeeping” mission despite President Donald Trump’s pledge to fully evacuate the Arab country. "A small peace keeping group of about 200 will remain in Syria for (a) period of time," she said in a statement. In December, Trump ordered his commanders to execute a "full" and "rapid" withdrawal of over 2,000 American forces from Syria within 30 days, arguing that with the defeat of Daesh the US military’s mission in the country had come to an end. The decision was met with strong criticism in Washington, with opponents expressing concern that after America’s withdrawal, US-allied Kurdish groups in northern Syria would be exposed to Turkey’s attacks. One of the main critics of the move was Republican Senator Lindsey Graham, a close ally of the president. Although they have lambasted US President Donald Trump’s military plan to withdraw troops from Syria, neither France nor the UK have committed to replacing the departing American soldiers. Trump's announcement on December 18 that the US would withdraw its 2,000 troops from Syria provoked consternation amongst its European allies – most notably France and the UK, the old continent’s largest military powers, both of which have special forces in the country. The former says it has “around 1,000” soldiers in Syria; the UK has not revealed how many troops it has on the ground. In the immediate aftermath of this declaration from the White House, Paris and London both refuted Trump’s claim that “we have won against ISIS” (another name for the Islamic State group), with French Defence Minister Florence Parly insisting that the “Islamic State [another name for the Islamic State group] has not been wiped from the map”, while the UK Foreign Office asserted that “much remains to be done and we must not lose sight of the threat [the IS group] pose”. Speaking to Reuters on December 20, a French presidential source went further, stating that “the coalition’s spine is the United States”. Adding to French and British concerns, the Kurdish forces who took back control swathes of northeastern Syria from the IS group warned that, if attacked without Western support, they may no longer be able to guard the hundreds of European jihadists held in their jails – leading to US calls for European countries to repatriate these prisoners. Yet despite the Franco-British protestations, neither country has committed to increasing its military presence in Syria. One French government official even told AFP on February 15: “It is totally out of the question to have French troops on the ground without the Americans there”. 'Reports have emerged of a deal clinched between the United States and Daesh, under which Washington has received massive amounts of gold in exchange for providing safe passage to the terror group’s members in Syria. The deal gave the United States “tens of tons of gold that the terror organization had stolen,” the official Syrian Arab News Agency (SANA) reported on Tuesday, citing local sources. In return, US forces would allow the terrorists and their ringleaders to escape their hideouts in the eastern province of Dayr al-Zawr, the agency added. The gold has been carried away from the province’s al-Baghouz area on board helicopters. The helicopters, according to eyewitnesses, transported large boxloads of “spoils” from the al-Dashisha area in the countryside of Hasaka in northeastern Syria. American forces have already appropriated and shipped out huge quantities of gold they had seized in Daesh’s strongholds, bringing the total amount of gold acquired and transferred to the US to around 50 tons, SANA said. Canada, State Sponsor of Terrorism ? Canada, State Sponsor of Terrorism? Role of Canadian Embassy in Jordan in ISIS Recruitment? 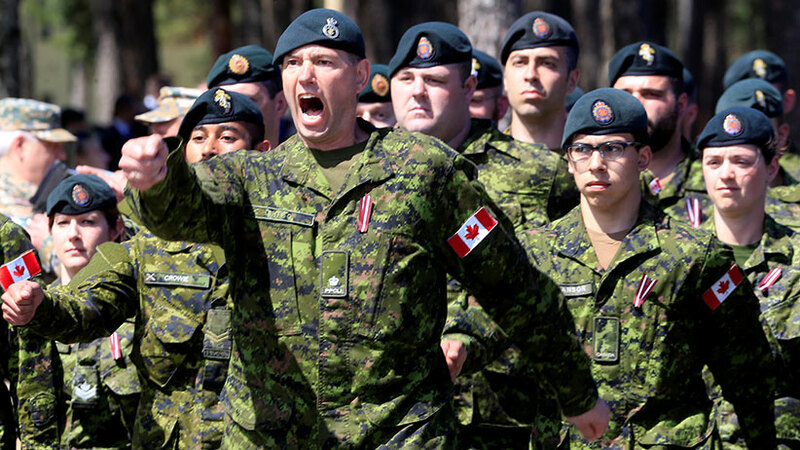 Canadian Army in Latvia: We got order from NATO PM J. Trudeau: we will defend Latvia from Russian invasion. 'UN Special Envoy for Syria Geir O. Pedersen has underlined Syria’s sovereignty over the Golan Heights, rejecting a US congressional motion to recognize Israel's annexation of the occupied territory. “Obviously the Security Council is very clear that the Golan is Syrian territory, and the first aspect of [Resolution] 2254 is of course the territorial integrity of Syria,” Pedersen told reporters at a Security Council briefing on Syria held on Thursday in New York. He made the comments in response to a question regarding a bill introduced by Republican members of the US congress which seeks to recognize Syria’s Golan Heights as Israeli territory. The measure, brought by Senators Ted Cruz and Tom Cotton as well as Representative Mike Gallagher, cites concerns about what the lawmakers call a “threat” posed by Iran. “The United States has been committed for over 40 years to ensuring Israel’s security from attacks emanating from across the Golan Heights,” the bill’s sponsors said Wednesday. Israeli officials have long pushed for US recognition of the Tel Aviv regime’s sovereignty claims over the territory, which was seized from Syria in 1967. Israeli Prime Minister Benjamin Netanyahu openly discussed the issue with both US President Donald Trump and Vice President Mike Pence during his visit to the White House in 2017, urging them to recognize Israel’s sovereignty. Netanyahu has stepped up his efforts over the past years, using the presence of Iranian military advisers and Lebanese resistance movement Hezbollah’s fighters in Syria as a scare tactic to convince US leaders. 'US National Security Adviser John Bolton says he has discussed a long-term military presence in Syria with his British and French counterparts, despite an order by President Donald Trump to evacuate American troops from the Arab country. Speaking to ABC News on Sunday, Bolton was hopeful that Britain and France would also join the US efforts to prevent Daesh’s resurgence. "It hasn't happened formally yet, but they're looking at it. I think it's very important that we try and get this up. The ISIS threat, the al Qaeda threat, the terrorist threat is an ideological threat worldwide and it's something that I think we have to be vigilant against for the foreseeable future," he said using another acronym for Daesh. Bolton reaffirmed President Donald Trump's assessment of Daesh’s defeat in Syria but cautioned that the threat still persisted because members of the group were spread around the world. "The president has been, I think, as clear as clear can be when he talks about the defeat of the ISIS territorial caliphate," Bolton said. "He has never said that the elimination of the territorial caliphate means the end of ISIS in total. "We know that's not the case. We know right now that there are ISIS fighters scattered still around Syria and Iraq, and that ISIS itself is growing in other parts of the world. The ISIS threat will remain." 'In 1998, the United Nations convened the Conference of Rome, which created the International Criminal Court (ICC). Of course, the aim was not to create a super-tribunal which would legislate, on behalf of the member states, in the name of humanity, but to possess a tool capable of judging criminals at the end of a war, when the institutions of the vanquished are diminished or destroyed. Thus the statutes of the Court emphasize that it may only accept a case with the agreement of the local justice system. But these same statutes also state:that it may take on the case of a crime committed by a citizen of a non-member country, inside a member country, in place of the victim country; as well as a crime committed by anyone, anywhere, as long as it is handled by the Security Council of the United Nations. In both cases, the Rome Statute, developed within the UNO and signed by a few States, may apply to all states, even that of non-members. This is why the three greatest world States – China, the United States and Russia – refused to ratify it. They saw in it – quite rightly – a violation of the principle of sovereignty, formulated in the 18th century by the legal expert Emer de Vattel, and voted into action by the 1969 Vienna Convention on the Law of Treaties . Last September, the ICC declared admissible a complaint against the authorities of Myanmar, despite the fact that it is a non-member because it was said to have committed atrocities which provoked the exodus of the Rohingyas. The Court considered itself competent because the victims fled to Bangladesh, which is a signatory of the Rome Statute . On this model, a family of the Muslim Brotherhood recently filed a complaint against President Bashar el-Assad and the Syrian representatives, although the Syrian Arab Republic is not a member of the Court. The family claims to have witnessed various atrocities and was obliged to flee to Jordan. The Court would have to ignore the fact that the Muslim Brotherhood is the heart of Islamist terrorism and that it is listed as a terrorist organization in many countries. Logically, though, it could declare itself competent, since Jordan is a signatory of the Rome Statute. However, on May 22, 2014, when the Western powers and their Gulf allies sought to engage the ICC via the Security Council in the context of the events in Syria, both China and Russia exercised their veto . As an aspiring journalist, it is hard to keep up with which country is at the top of Donald Trump’s “to-bomb” list, given the target appears to change every week or so. Since the infamous days of his campaign trail up until the present day, the US president has held a deep animosity towards Tehran. However, the government’s focus appears to shift away from the Islamic Republic periodically – one minute it’s North Korea, every April since his election he also decides he briefly wants to bomb Assad in Syria, and most recently, his entire administration has raved incessantly about Venezuela. No matter how the news cycle goes, and no matter the sort of historical death-squad arming psychopath Trump appoints as Special Envoy to Venezuela, at the end of the day the media focus inevitably continues to fall back on Iran (and with it, Donald Trump’s keen and hawkish eye). 'Russia has warned that members of the Takfiri Hayat Tahrir al-Sham (HTS) terrorist outfit together with the so-called civil defense group White Helmets are planning to carry out chemical attacks across Syria in a bid to incriminate Syrian government forces and invent pretexts for possible acts of aggression on army troops. Speaking during a press briefing in the Russian capital, Moscow, on Friday, Russia’s Foreign Ministry spokeswoman Maria Zakharova said there were reports that the Takfiri terrorists in coordination with the Western-backed group, which has been repeatedly accused of cooperating with Takfiri terrorists and staging false-flag gas attacks, are establishing arms caches in the northwestern provinces of Aleppo and Idlib, the western coastal province of Latakia as well as the western-central province of Hama. “We are closely monitoring the situation in Idlib de-escalation zone. The terrorists operating there are not stopping their provocative false-flag attacks against government forces. Since the beginning of the year, over 460 such incidents have been recorded,” Zakharova said. 'The US military is now making plans to keep almost 1,000 troops in Syria, officials said, a shift that comes three months after President Donald Trump ordered a complete withdrawal, the Wall Street Journal reported on Sunday, citing unidentified US officials. Talks with Turkey, European allies and US-backed Kurdish fighters have so far failed to secure an agreement to create a safe zone in northeastern Syria, part of Trump’s plan for leaving Syria, the Journal said. The US now plans to keep working with Kurdish fighters in Syria despite Turkish threats to cross the border and attack the Kurds, the US officials said. The proposal may keep as many as 1,000 American forces, spread from the north of Syria to the south, they said. Once the last bastion of the Islamic State (IS) group is seized, the US may shift its focus towards withdrawing hundreds of American forces, in keeping with what Trump had originally ordered. The evolving discussions represent a shift away from Trump’s December directive to get all Americans out of Syria. His original decision to withdraw all of the more-than-2,000 US troops from Syria triggered the resignation of Pentagon chief Jim Mattis and drew widespread concern that America was leaving the fight against IS before it was finished. Trump initially stood by his decision, but members of his national-security team urged him to secure assurances that Turkish President Recep Tayyip Erdogan wouldn’t attack the US-backed Kurdish fighters once America withdrew, the WSJ said. Turkey has refused to do so. 'The Russian and Syrian coordination centers on returning refugees have censured the US over its latest decision to provide millions of dollars to the Western-backed White Helmets “aid” group, while preventing aid from reaching a refugee camp in southern Syria. The centers said in a joint statement released on Tuesday that the United States had pledged $5 million in donation to the Western-backed group, which has been repeatedly accused of cooperating with Takfiri terrorists and staging false-flag gas attacks, at the third Conference on “Supporting the Future of Syria and the Region” in Brussels, Belgium, earlier this month. During the conference, the EU also pledged €8 billion and the US $400 million in so-called aid to Syrian refugees. “This aid will not reach Syrian people; but will rather end up in the hands of White Helmets terrorists to fund their acts of fabricating incidents involving toxic chemicals,” the statement read. It further noted that the participants in the Brussels conference, who claim to be supporting Syrians, are actually those who have imposed severe economic sanctions on them. “The money raised [during the event] will go only to displaced people in Jordan, Lebanon, and Turkey, which seek to encourage them to remain there and hinder their return to Syria,” the statement pointed out.